Godzilla has terrorized Japanese moviegoers for decades. Now a new Godzilla is about to terrorize the Japanese whaling fleet. Gojira, Godzilla in English and shown above in boat-form, is the newest addition to the Sea Shepherd Conservation Society’s anti-whaling fleet. 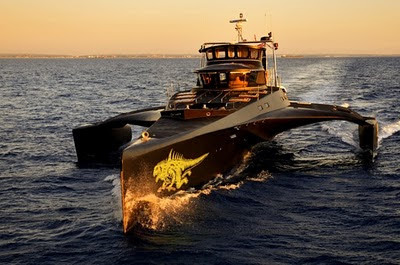 Today, it is set to join the Bob Barker and the Steve Irwin, the other two Sea Shepherd vessels, in Hobart, Australia. They will set sail for the Southern Ocean on Thursday, embarking on their annual campaign to prevent the killing of whales. 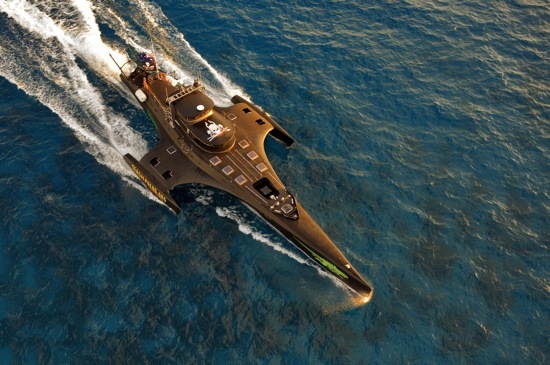 You're probably familiar with Sea Shepherd. The anti-whaling group has become famous because of “Whale Wars,” a weekly reality television series that debuted on Animal Planet on Nov. 7, 2008. The show details the harassing encounters the Sea Shepherd fleet has with the Japanese whalers each year in the Southern Ocean, all in the name of saving whales. Very sleek and intimidating; and note the Godzilla decal near the bow. The Sea Shepherd has been trying to stop the killing for six years, going on the offensive during the season which runs from December through February or March. “I can guarantee we’re going to cut their quota in half, but we’re aiming for 100 percent this year,” Watson said via the Australian Associated Press. “We’re prepared for their aggression, we’re stronger and better prepared and better equipped than ever... Every year we go down stronger and they go down weaker, so we’re slowly beating them down. “I think we’re winning this. Most telling of all is that for the first time ever the Japanese fleet hasn’t left. They usually leave between the 9th and 19th of November. According to what Greenpeace Japan officials told the Japan Times, the fleet is late in leaving because it hasn’t secured a refueling vessel for the trip. No doubt it will, and the intense pressure will begin. Even on land the pressure is intensifying on the whaling fleet to cut down on whaling. The Japan Times reports that the International Whaling Commission submitted a proposal in April for the fleet to reduce its quota from 800 to 200 over the next 10 years. And in May, Australia launched legal action at the International Court of Justice in the Hague to stop Japan’s research whaling in the Antarctic. As it is, the fleet’s annual take has continued to decline because of the Sea Shepherd's efforts, the methods and madness of which make great reality TV. The fourth season of “Whale Wars” will begin airing in early June 2011. This season’s motto: Operation No Compromise. The Japanese are taking the year off, They have a large surplus of whale meat in Japan right now. Obviously they've been killing more whales than they want us to believe. This is the worst possible scenario for Watson. TLC will be forced to can Whale Wars donations will dry up and he'll have no money to maintain his now useless toys. Brilliant plan by the Japanese if you ask me. Be a part of it. Become an online volunteer reporting or researching sharks for the Shark Trust. Our beloved whales and the whale war heros got a bit of help in the form of the earthquake. Think it might be a reality check Japan?